Stupid Patents stories at Techdirt. stories filed under: "stupid patents"
What if we allowed some people to patent the law and then demand money from the rest of us just for following it? As anyone with a basic understanding of democratic principles can see, that is a terrible idea. In a democracy, elected representatives write laws that apply to everyone, ideally, based on the public interest. We shouldn't let private parties "own" legal principles or use technical jargon to re-cast those principles as "inventions." But that's exactly what the U.S. Patent Office has allowed two inventors, Nicholas Hall and Steven Eakin, to do. Last September, the government proclaimed that Hall and Eakin are the inventors of "Methods and Systems for User Opt-In to Data Privacy Agreements," U.S. Patent No. 10,075,451. The owner of this patent, a company called "Veripath," is already filing lawsuits against companies that make privacy compliance software. With Congress and many states actively engaged in debates over consumer privacy laws, Veripath might soon be using this patent to extract licensing cash from U.S. companies as well. Claim 1 of the '451 patent describes a basic data privacy agreement. An API provides personal information from a software application; then the user is asked for a "required permission" for the use of that information. There's one add-on to the privacy deal: in exchange for the permission, the user gets access to "at least one enhanced function." The next several claims go on to describe minor variations on this theme. Claim 2 specifies that the "enhanced function" won't be available to other users. Claim 3 describes the enhanced function as being fewer advertisements; Claim 4 describes offering the enhanced function in exchange for a monetary payment. To say this "method" is well-known is a major understatement. The idea of exchanging privacy for enhanced functionality or better service is so widespread that it has been codified in law. For example, last year's California Consumer Privacy Act (CCPA) specifically allows a business to offer "incentives" to a user to collect and sell their data. That includes "financial incentives," or "a different price, rate, level, or quality of goods or services." The fact that state legislators were familiar enough with these concepts to write them into law is a sign of just how ubiquitous and uninventive they are. This is not technology this is policy. Some background: Venpath, Inc., a company with a New York address that appears to be a virtual office, assigned the rights in the '451 patent to VeriPath just days before the patent issued in September last year. As it happens, the FTC began enforcement proceedings against VenPath last September. The FTC's complaint [PDF] alleged that VenPath's website represented that "VenPath participates in and has certified its compliance with the EU-U.S. Privacy Shield Framework." The FTC alleged a count of "privacy misrepresentation." It claimed that VenPath "did not complete the steps necessary to renew its participation in the EU-U.S. Privacy Shield framework after that certification expired in October 2017." The FTC issued a Decision and Order [PDF] requiring VenPath to remove the misrepresentations. An exhibit [PDF] attached to the complaint shows that one of the named inventors on the patent, Nick Hall, contacted Faktor to ask what its prices were. Hall identified himself as the CEO of VenPath. Once Faktor responded, Veripath sued Faktor in federal court in New York. In its lawsuits, Veripath claims that basic warnings about cookies on websites, a now-common method of complying with the GDPR, violate its patent. The lawsuit against Faktor notes that Faktor's own website "might not work properly" unless a user consents to having her browser accept cookies. Veripath and its legal team argue that this simple deal—accepting cookie use, in order to visit websites—is enough to infringe the patent. They also claim that Faktor's Privacy Manager software infringes at least Claim 1 of the patent, and facilitates infringement by others. The '451 patent should never have been granted. In our view, its claims are clearly ineligible for patent protection under Alice v. CLS Bank. In Alice, the Supreme Court held that an abstract idea (like privacy-for-functionality) doesn't become eligible for a patent simply because it is implemented using generic technology. Courts have struck down similar claims, like a patent on the idea of conditioning access to content on viewing ads. Even when a patent is invalid, defendants face pressure to settle. Patent litigation is expensive and it can cost tens or hundreds of thousands of dollars just to get through the early stages. To really protect innovation we have to ensure that patents like the '451 patent are never issued in the first place. The fact that this patent was granted shows the Patent Office is failing to apply the law. We are currently urging the public to tell the Patent Office to stop issuing abstract software patents. You can use our Action Center to submit comments. Republished from the EFF's Stupid Patent of the Month series. One of the nation's most prolific patent trolls is finally dead. After more than a decade of litigation and more than 500 patent suits, Shipping & Transit LLC (formerly known as Arrivalstar) has filed for bankruptcy. As part of its bankruptcy filing [PDF], Shipping & Transit was required to state how much its portfolio of 34 U.S. patents is worth. Its answer: $1. We are recognizing Shipping & Transit's entire U.S. portfolio as our latest stupid patent of the month. We agree that these patents are worthless. Indeed, they have always been worthless, except as litigation weapons. In the hands of their unscrupulous owners, they caused enormous damage, costing productive companies more than $15 million in licensing fees and untold legal expenses. That's tens of millions of dollars that won't be used to invest in new products, reward shareholders, or give raises to workers. All patent troll stories start with Patent Office. 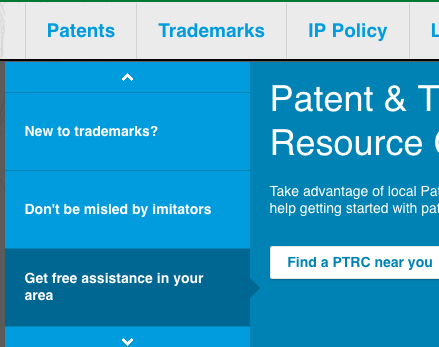 You can't be a patent troll without patents. And you can't have patents unless with Patent Office grants them. We have found many occasions to write about problems with patent examination. The Patent Office spends only a few hours per application and regularly issues software patents without considering any real-world software at all. This helps explain how an entity like Shipping & Transit could end up with dozens of valueless patents. Shipping & Transit claims to be "one of the pioneers of determining when something is arriving and being able to message that out." Its patent portfolio mostly relates to tracking vehicles and packages. Of course, Shipping & Transit did not invent GPS tracking or any protocols for wireless communication. Rather, its patents claim mundane methods of using existing technology. Consider U.S. Patent No. 6,415,207. This patent claims a "system for monitoring and reporting status of vehicles." It describes using computer and software components to store status information associated with a vehicle, and communicate that information when requested. In other words: vehicle tracking, but with a computer. It doesn't disclose any remotely new software or computer technology. Rather, the patent claims the use of computer and software components to perform routine database and communications operations. There is nothing inventive about it. Given that it was aggressively filing lawsuits as recently as 2016, it is striking to see Shipping & Transit now admit that its patent portfolio is worthless. While many of its patents have expired, that is not true of all of them. For example, U.S. Patent No. 6,415,207 does not expire until 2020. Also, the statute of limitations for patent infringement is six years. An expired patent can be asserted against past infringement so long as the infringement occurred before the patent expired and within the last six years. Many of the patents Shipping & Transit have asserted in court expired less than six years before its bankruptcy filing. Yet Shipping & Transit valued all of its U.S. patents at $1. When it was known as Arrivalstar, Shipping & Transit sued a number of cities and public transit agencies claiming that transit apps infringed its patents. (While the exact legal relationship between Arrivalstar S.A. and Shipping & Transit LLC is unclear, Shipping & Transit has itself said that it was "formerly known as Arrivalstar.") Its litigation had all the hallmarks of classic patent trolling. When transit agencies banded together to defend themselves on the merits, it quickly abandoned its claims. Plaintiff's business model involves filing hundreds of patent infringement lawsuits, mostly against small companies, and leveraging the high cost of litigation to extract settlements for amounts less than $50,000. For many years, this strategy worked. Shipping & Transit/Arrivalstar is reported to have collected more than $15 million from defendants between 2009 and 2013. Finally, after more than a decade, Shipping & Transit's exploitative tactics finally caught up with it. First one, then another federal judge awarded attorneys' fees to the defendants in cases brought by Shipping & Transit. With defendants successfully fighting back, it stopped filing new cases. Shipping & Transit filed its bankruptcy petition [PDF] on September 6, 2018. The petition discloses that Shipping & Transit's gross revenue in the two-year period of 2016 and 2017 was just over $1 million dollars. Of course, this does not include the legal costs that Shipping & Transit imposed on its many targets. It claimed to have no revenue in 2018. Other than its 34 U.S patents (valued at $1), and its 29 worldwide patents (also valued at $1), Shipping & Transit claims to have no assets at all. Where did more than $1 million dollars it received go? The application doesn't say. The bankruptcy petition, submitted under the penalty of perjury and signed by Shipping & Transit's Managing Member Peter Sirianni, contains at least one false statement. A bankruptcy petition includes Statement of Financial Affairs (Form 207). Part 3 of this form requires the debtor to list any "legal actions … in which the debtor was involved in any capacity—within 1 year before filing this case." Shipping & Transit said "none." But that isn't true. On July 23, 2018, a writ of execution [PDF] was issued as to Shipping & Transit in the amount of $119,712.20. This writ was issued in Shipping and Transit, LLC v. 1A Auto, Inc., Case No. 9:16-cv-81039, in the Southern District of Florida. The judge in that case had issued a final judgment [PDF] on April 3, 2018, awarding fees and costs to the defendant. Both of these orders, and many other court filings, took place within a year of Shipping & Transit's bankruptcy petition. Yet Shipping & Transit still affirmed that it had not been involved in litigation "in any capacity" within a year of the bankruptcy filing. Shipping & Transit's petition does list 1A Auto as an unsecured creditor. Even though a court has issued a writ of execution with a precise six-figure amount, Shipping & Transit stated that the amount of 1A Auto's claim is "unknown." It is not surprising that a decade of abusive patent trolling would end with an inaccurate bankruptcy petition. To be clear, our opinion that Shipping & Transit's bankruptcy petition includes a false statement submitted under oath is based on the following disclosed facts: its answer to Part 3 of Form 207 of its petition, and the public docket in Case No. 9:16-cv-81039 in the United States District Court for the Southern District of Florida. UPSTO Director Andrei Iancu recently gave a speech where he suggested that those who complain about patent trolls are spreading "scary monster stories." It may finally be dead, but Shipping & Transit was a patent troll, and it was very, very real. We estimate that its lawsuits caused tens of millions of dollars of economic harm (in litigation costs and undeserved settlements) and distracted hundreds of productive companies from their missions. Research shows that companies sued for patent infringement later invest less in R&D. A patent system truly focused on innovation should not be issuing the kind of worthless patents that fueled Shipping & Transit's years of trolling. Courts should also do more to prevent litigation abuse. It shouldn't take an entire decade before an abusive patent troll faces consequences and has to shut down. While it lived, Shipping & Transit/Arrivalstar sued over 500 companies and threatened many hundreds more. That might be a "monster story," but it is true. Reposted from the EFF's Stupid Patent of the Month series. On October 11, 2016, the U.S. Supreme Court is scheduled to hear oral arguments in the long-running Apple-Samsung litigation. The issue is whether Apple, by virtue of having its designed patents infringed by Samsung, is entitled to all of Samsung's profits made from the infringing phones (regardless of how much that design contributed to the value of the phone). This case -- in which EFF submitted an amicus brief arguing the award of Samsung's total profit is improper -- is important for many reasons. But one reason stands out: it is trivially easy to get a design patent on trivial designs and, unless the Supreme Court changes the law, that can lead to anything-but-trivial awards in court. This month's stupid patent, a design patent, shows just how broken the current system of design patents is. 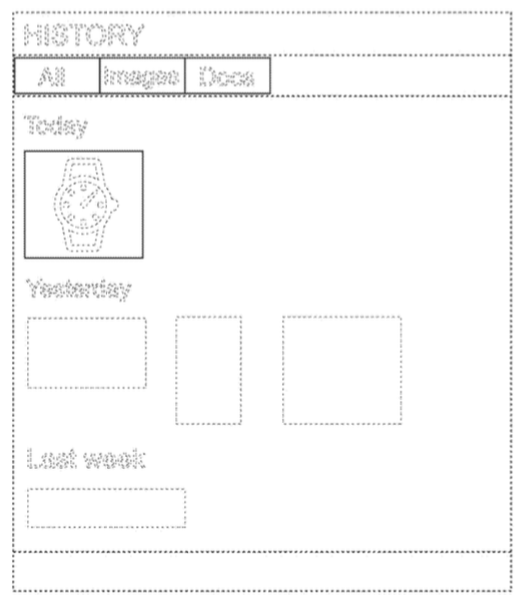 Design patents, unlike the utility patents we usually feature, consist only of a single claim followed by pictures. It is generally the pictures that inform the public as to what is claimed. Importantly, in a design patent only the features drawn in solid lines are claimed. Anything in dotted lines is generally not part of the claim. To be clear, this patent would likely not be infringed if someone arranged three rectangles and a square in a different way (say, if the rectangles were arranged vertically instead of horizontally), and the USPTO itself may not infringe as the prior art would likely narrow this patent significantly. But even the possibility of a finding of infringement may be enough to cause concern for many people who may be accused of infringing a design patent. That's because under current law, if someone is found to infringe a design patent, the patent owner can argue that it is entitled to all of the profits from that website. The Supreme Court has a chance to fix this last issue in the upcoming Apple-Samsung decision. But that won't change the fact that the Patent Office still issues patents on trivial designs at an alarming rate. This latest patent is just another in a long line of questionable patents. Reposted from the EFF's Stupid Design Patent of the Month series. On August 30, 2016, the Patent Office issued U.S. Patent No. 9,430,468, titled; "Online peer review and method." The owner of this patent is none other than Elsevier, the giant academic publisher. When it first applied for the patent, Elsevier sought very broad claims that could have covered a wide range of online peer review. Fortunately, by the time the patent actually issued, its claims had been narrowed significantly. So, as a practical matter, the patent will be difficult to enforce. But we still think the patent is stupid, invalid, and an indictment of the system. Before discussing the patent, it is worth considering why Elsevier might want a government granted monopoly on methods of peer review. Elsevier owns more than 2000 academic journals. It charges huge fees and sometimes imposes bundling requirements whereby universities that want certain high profile journals must buy a package including other publications. Universities, libraries, and researchers are increasingly questioning whether this model makes sense. After all, universities usually pay the salaries of both the researchers that write the papers and of the referees who conduct peer review. Elsevier's business model has been compared to a restaurant where the customers bring the ingredients, do all the cooking, and then get hit with a $10,000 bill. The rise in wariness of Elsevier's business model correlates with the rise in popularity and acceptance of open access publishing. Dozens of universities have adopted open access policies mandating or recommending that researchers make their papers available to the public, either by publishing them in open access journals or by archiving them after publication in institutional repositories. In 2013, President Obama mandated that federally funded research be made available to the public no later than a year after publication, and it's likely that Congress will lock that policy into law. Facing an evolving landscape, Elsevier has sought other ways to reinforce its control of publishing. The company has tried to stop researchers from sharing their own papers in institutional repositories, and entered an endless legal battle with rogue repositories Sci-Hub and and LibGen. Again and again, when confronted with the changing face of academic publishing, Elsevier resorts to takedowns and litigation rather than reevaluating or modernizing its business model. Elsevier recently acquired SSRN, the beloved preprints repository for the social sciences and humanities. There are early signs that it will be a poor steward of SSRN. Together, the SSRN acquisition and this month's stupid patent present a troubling vision of Elsevier's new strategy: if you can't control the content anymore, then assert control over the infrastructures of scholarly publishing itself. Elsevier filed its patent application on June 28, 2012. The description of the invention is lengthy, but is essentially a description of the process of peer review, but on a computer. For example, it includes a detailed discussion of setting up user accounts, requiring new users to pass a CAPTCHA test, checking to see if the new user's email address is already associated with an account, receiving submissions, reviewing submissions, sending submissions back for corrections, etc, etc, etc. The patent departs slightly from typical peer review in its discussion of what it calls a "waterfall process." This is "the transfer of submitted articles from one journal to another journal." In other words, authors who are rejected by one journal are given an opportunity to immediately submit somewhere else. 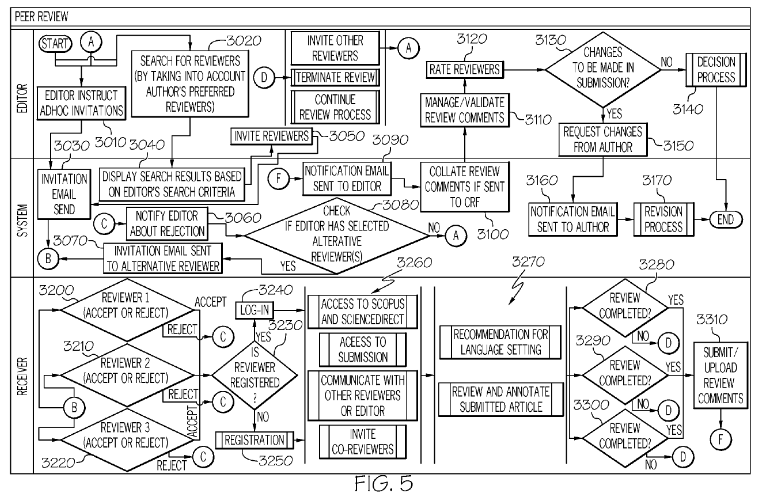 The text of the patent suggests that Elsevier believed that this waterfall process was its novel contribution. But the waterfall idea was not new in 2012. The process had been written about since at least 2009 and is often referred to as "cascading review." The patent examiner rejected Elsevier's application three times. But, taking advantage of the patent system's unlimited do-overs, Elsevier amended its claims by adding new limitations and narrowing the scope of its patent. Eventually, the examiner granted the application. The issued claims include many steps. Some of these steps, like "receive an author-submitted article," would be quite hard to avoid. Others are less essential. For example, the claims require automatically comparing a submission to previously published articles and using that data to recommend a particular journal as the best place to send the submission. So it would be an exaggeration to suggest the patent locks up all online peer review. We hope that Elsevier will not be aggressive in its own interpretation of the patent's scope. Unfortunately, its early statements suggest it does take an expansive view of the patent. For example, an Elsevier representative tweeted: "There is no need for concern regarding the patent. It's simply meant to protect our own proprietary waterfall system from being copied." But the waterfall system, aka cascading peer review, was known years before Elsevier filed its patent application. It cannot claim to own that process. Ultimately, even though the patent was narrowed, it is still a very bad patent. It is similar to Amazon's patent on white-background photography where narrowed but still obvious claims were allowed. Further, Elsevier's patent would face a significant challenge under Alice v CLS Bank, where the Supreme Court ruled that abstract ideas do not become eligible for a patent simply because they are implemented on a generic computer. To our dismay, the Patent Office did not even raise Alice v CLS Bank even though that case was handed down more than two years before this patent issued. Elsevier's patent is another illustration of why we still need fundamental patent reform. How do you store your paper files? Perhaps you leave them scattered on your desk or piled on the floor. If you're more organized, you might keep them in a cabinet. This month's stupid patent, US Patent No. 6,690,400 (the '400 patent), claims the idea of using "virtual cabinets" to graphically represent data storage and organization. While this is bad, the worse news is that the patent's owner is suing just about anyone who runs a website. The '400 patent is owned by Global Equity Management (SA) Pty. Ltd. ("GEMSA") which seems to be a classic patent troll. GEMSA is incorporated in Australia and appears to have no business other than patent litigation. The patent began its life with a company called Flash VOS. This company once offered a product that allowed users to run multiple operating systems on personal computers with x86-compatible processors. The '400 patent describes a graphical user interface for this system. The interface allows users to interact with "graphical depictions of cabinets" that represent memory partitions and different operating systems. GEMSA says that Flash VOS moved the computer industry a "quantum leap forwarded in the late 90's when it invented Systems Virtualization." But Flash VOS didn't invent partitions, didn't invent virtual machines, and didn't invent running multiple operating systems on a single computer. All of these concepts predate its patent application, some by decades. In any event, the '400 patent claims only a very specific, and in our view, quite mundane user interface. Importantly, the '400 patent's claims require very specific structures. For example, claim 1 requires "a secondary storage partitions window" and "at least one visible cabinet representing a discrete operating system." A user interface must have all of these features to infringe the claim. In the past year, GEMSA has sued dozens of companies, ranging from Airbnb to Zillow. In each case, it makes the bare assertion that the defendant's website infringes the '400 patent. For example, it simply states that "AIRBNB maintains, controls and/or operates a website with a graphical user interface ("GUI") at www.airbnb.com that infringes one or more claims of the '400 patent." As far as we can tell, GEMSA seems to think that anyone with a website that links to hosted content infringes its patent. Complaints with such sparse, and implausible, infringement allegations should be thrown out immediately for failure to state a claim. There will be no prizes for guessing where GEMSA has filed its litigation. Every one of its cases was filed in the Eastern District of Texas, where we have long complained that local rules favor patent trolls like GEMSA. Venue reform legislation currently before Congress would stop trolls flocking to the Eastern District of Texas. That might help reduce abusive patent trolling. But we still need broader patent reform to ensure that such weak patents don't lead to abusive troll litigation. There are certain general rules about who not to attack that you should generally stick to: You should never get involved in a land war in Asia. You should never pick a fight with people who buy ink by the barrel. And perhaps now we can add: never sue the EFF for defamation for calling your patent stupid. But that appears to be exactly what Scott A. Horstemeyer is doing. Back at the end of April, the EFF featured a patent held by Horstemeyer in its monthly "Stupid Patent of the Month." We actually reposted it ourselves. You can go back and read those original posts detailing how and why the patent is stupid. But Horstemeyer isn't happy. It apparently hurt his feelings for his little patent to be called out among all the stupid patents for extra special treatment. So he had a lawyer send a threat letter claiming that the post included "false, defamatory and malicious statements." The letter lays out three such claims. First, saying that it's "false" to say that "patent applicants attorneys have an ethical obligation to disclose any information material to patentability." Yes, that's really a battle they want to fight: To argue that they have no ethical obligation to do so, and that to claim otherwise is somehow defamatory. This is wrong on all sorts of levels. Next, they claim that saying that "Horstemeyer has not made any genuine contribution to notification 'technology'" and that "he has shown advanced skill at gaming the patent system" is defamatory because it "impugns" him. That's not how defamation works, but okay. Finally, they object to the claim that "It appears Horstemeyer hoped the Office would not notice [the Alice] decision and would simply rubber-stamp his application." None of these statements comes even remotely close to being defamatory. They are all either statements of opinion or, at best, hyperbole. To argue that these are defamatory is simply ridiculous. But rather than just do the initially dumb thing of sending a threat letter, hoping it would lead the EFF to pull its story down (ha! ), Horstemeyer took it a step further and had his lawyer file an actual complaint in a Georgia county court. The lawsuit repeats, verbatim, the complaints in the letter. And it goes even further, ridiculously arguing that because Mark Cuban and Markus "notch" Persson donated hundreds of thousands of dollars to EFF, with Cuban's money going to form the "Mark Cuban Chair to Eliminate Stupid Patents" (a position currently held by Daniel Nazer, who wrote the original EFF post), it shows that the "defamation" was done "with malice" and "for their own selfish financial benefit and profit." This also makes absolutely no sense. Nazer doesn't make any additional money by calling out Horstemeyer's stupid patent for being stupid. The whole thing is nuts. The EFF has responded by sending a letter, noting that Horstemeyer knew they were responding and still rushed to the courthouse. As the EFF rightly notes, nothing in the article is even remotely defamatory. The Article is opinion that is absolutely protected by the First Amendment to the United States Constitution and state law, including that of Georgia and California. As your Letter does not identify any specific statement of fact that is provably false, it instead appears that your client takes issue with EFF expressing its belief that: Mr. Horstemeyer sought and was granted a "stupid" patent, - U.S. Patent No. 9,013,334 (the "'334 Patent"); that he appeared to "gam[e] the patent system" in doing so; and he may have acted unethically. While you may disagree with this opinion, it is not actionable. Further, assuming that your client is able to establish personal jurisdiction over EFF and Mr. Nazer, EFF will move for an immediate determination of whether the Article is protected speech, and will further move for its attorney's fees, under the applicable anti-SLAPP statute and/or under Fed. R. Civ. P. 11. See. e.g., Cal.Civ.Proc.Code § 425.16 (California anti-SLAPP statute); 0.C.G.A. 9-11-11.1 (Georgia anti-SLAPP statute); Hindu Temple and Community Center of High Desert. Inc. v. Raghunathan, 311 Ga. App. 109 (2011) (awarding fees); Koly v. Enney, 269 Fed. Appx. 861, 36 Media L. Rep. 1513 (11th Cir. March 7, 2008) (award of attorney's fees required under Fed. R. Civ. P. 11 because allegations that conduct of corporate officers were examples of "impropriety" and a "serious conflict of interest'' were personal opinions based on the facts set out in a corporate communication to other directors). bring further publicity to his actions with regards to the '334 Patent, specifically his failure to disclose Judge Wu's decision to the PTO as well as his apparent belief in this and other patent applications that he is under no duty to disclose adverse court decisions regarding substantially similar patents.